Matching the daily recommended intake of fruits and vegetables can be quite a task for most of us, especially after the convenience we have achieved with junk and processed foods. Truth is, there is no set number of servings of fresh fruits and vegetables. It varies as per our caloric need and meeting this number can prove to be easier than you think. Include a piece of fruit or a glass of fresh fruit juice at breakfast or add cut fruits to your breakfast cereal. Eat a fruit or carrot sticks for a mid-morning snack. Consume more salad vegetables such as cucumber, lettuce, tomato, cabbage, capsicum during meals. While having soup, add a lot of vegetables to it. 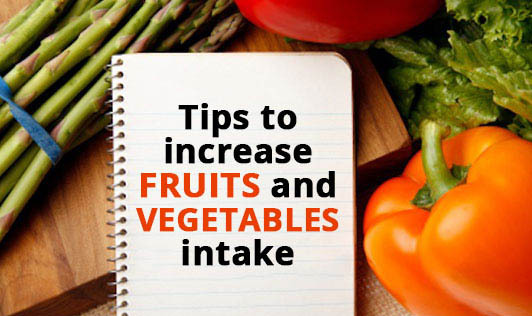 Keep cut vegetables and fruits in the refrigerator as a handy snack. Mix up a smoothie in the blender with fresh fruits and low-fat yogurt. Replace carbonated beverages with vegetable or fruit juices. When eating out, select a salad, choose a main courses with vegetables, and select fruit salad for dessert. Eat a dry fruit mix when you are looking for a quick snack. Incorporate vegetables and leafy greens into your omelet and pasta.